We are Paul and Gill and we live in Wrenbury, Cheshire, with our two cats Coppin and Pippin. We are keen gardeners and each year grow a variety of fruit and vegetables including, chillies, pumpkins, raspberries, gooseberries and of course apples. We have made cider for many years but in small quantities. Encouraged by family and friends we started making cider in larger amounts in 2007. Prior to this between 2004 - 2007 we planted a small orchard with seven different varieties of cider making fruit. These are Kingston Black, Browns, Harry Masters, Sweet Coppin, Foxwhelp, Dabinett and Yarlington Mill. As far as we know this is an unique orchard in Cheshire. We have been very lucky to have a great horticulturist neighbour who has taught us how to bud and graft apple trees and to date we have planted four additional small apple orchards in South Cheshire on farms and small holdings, eventually we hope to harvest this fruit and each year we are becoming more self sufficient with apples. In two years time we hope to be using all Cheshire cider apples in our ciders. 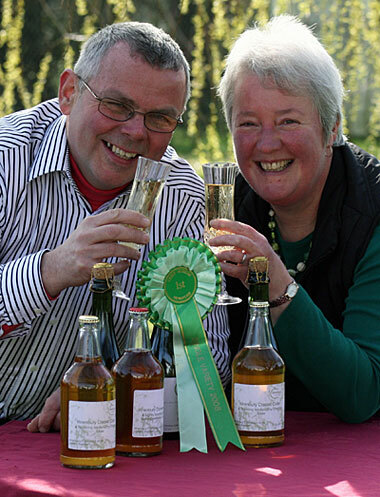 Since 2007 we have won three awards at major cider competition trials. Our aim is to produce ciders that are an alternative to wine and champagne and which will compliment a variety of dishes. We do not spray our trees and just let nature take its course. You will not find our ciders in large supermarkets or big multiples as our philosophy is to support small family businesses in an effort to help farm shops and small retailers be distinct and offer their customers something a little different.